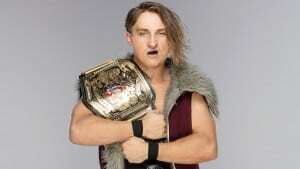 We chatted to Pete Dunne following his triumphant, title-winning match against Tyler Bate. Q: So, congrats on the match at TakeOver, it was amazing and the reaction you got from the crowd was stunning. What did it feel like to be stood in the ring at the end? A: It was unbelievable, really. To be honest, when we were in there we didn’t realise what we’d just done. We felt like it went well, but it was only afterwards when they’d rushed me straight off to the media and I was on the phone with someone from ESPN that it really started to resonate with me how well it actually went. I think the big thing is the fact that it was myself and Tyler, who are from this small city in the UK and somehow we’ve ended up on top of not just British wrestling, but wrestling, at somewhere as big as TakeOver. It’s an incredible feeling. Q: Obviously now, you’ve set the standard for what the Americans hopefully feel British wrestling’s like. How are you going to progress it to another level from here on? A: My mindset has always been since we started to just kill it every time. Because in our mind, the UK show, the future’s uncertain with it – we don’t know, we’re in the dark like everyone else. So all we can do, every time we go out there, is to put in 100% and kill it as much as we can. So that’s still my mindset going forward. There’s a lot of untouched talent in the UK and even in that group of sixteen of us, and outside of it as well, there’s so much more talent for people to see and so many more people to work with. Myself and Tyler, I feel like we can top it, that we can do it again. Q: Now you’re touring with NXT. The main event was five guys from NXT. Is that where you see yourself in the future, as the main event? A: I’d love to. I’d love to do Wrestlemania one day. It wasn’t necessarily a goal I had when I got into wrestling. I wanted to work, I wanted to say I did it and I wanted to make a living off wrestling. To me, it didn’t matter where, but things change and now I’m here. This is a whole new window of opportunities opening and goals to progress with. I’d love to do Wrestlemania one day. That’s the ultimate goal now. Q: Going back to the match in Chicago, what was the reaction from yourself and management to the chant of “UK” from the US crowd? A: That was bizarre to me. The amount of shows I’ve done years ago where the UK crowds are chanting “USA”, that was a typical Butlins thing, like at holiday camps. So to completely flip it the other way and to have US fans chanting “UK”, it’s unbelievable. That’s one of the things in the ring we did realise was happening where we thought “that’s special”. Again, watching it back was a completely different experience for us, as to being in there. We were just focused on what we were doing, and then it all started to settle in, like you say about management, how pleased they all were with it and I hope it’s helped us solidify a UK brand. Like I say, my mindset’s always “kill it every time”, because that’s ultimately what we want. We’re proud of British wrestling. It’s a scene we’ve built up from nothing – this generation, we built that. When I started wrestling, I think the least I ever wrestled in front of was two people? The first match I ever had was in front of three people, and if we got twenty people in, we were chuffed. So we completely built that from the ground up – after it went off TV there was nothing left. It’s something we’re really proud of and if we can get it back on TV, that’s the ultimate aim right now. Q: What past wrestlers would you attribute to helping develop your Bruiserweight? It’s quite unique. A: When I first got into wrestling, I was into independent wrestling – remember the Wrestling Channel when that was about? I was into AJ Styles and those kind of people. I wanted to wrestle like them and I spent years trying to do that. And then people said to me “you need to be more British” so I’d look into Regal and Fit Finlay. So there’s definitely parts of both those styles – there’s the athletic stuff and that old British stuff, that Mean Street and Fit Finlay. But what I do know is that you can’t be like anyone. I spent ten years trying to be like other people and trying to learn from the best wrestlers, and one year trying to be myself. In one year I’ve made more progress than the ten years prior to that. Be completely unique and anything you see anyone else doing, do the complete opposite. Anything I don’t like about wrestling, I change in what I do. I just try to stand out as much as possible. Q: Where do you see the future in the WWE? Do you see yourself as the first British WWE champion? A: Short term, I want this UK show, that’s what I feel passionate about. I want to elevate the whole of British wrestling. I want to continue to do that. I feel me and Tyler helped that a little bit at TakeOver, and now going forward, I really want that show to happen. Long term, I’d love to be in Wrestlemania. That’s another goal of mine. Q: What was it like for you having Jim Ross commentate on your match? A: It was great. Before the show, he found us in catering and came over and gave us some advice, so that felt really special. I think it really added to the match, having him there. It helped it feel bigger than two guys who are relatively unknown to the audience. He made us come across like superstars and feel like we fit in here. Q: You also mentioned Regal as a big influence. What’s it been like working with him onscreen? A: It’s brilliant. I have him to thank for getting here in the first place. It’s a funny story. I did a routine show in Mansfield, and there were maybe 100 people there. I was sitting at home – and to be honest, I wasn’t really that motivated for it, it just felt like part of the routine of going to work – and I kept getting missed calls from a number that I didn’t recognise. I never really had any contact with Regal before that, but I kept getting missed calls. On the third time, I realised it said ‘Stanford, Connecticut’ and thought “oh, I’d better pick this up”. So I answer, and it was Regal, completely out of the blue, and he said he was in England and wanted to come and watch me in that show in Mansfield. Instantly my motivation went through the roof. So I met him there, he watched my match and really liked it and he set me up a tryout for November. What are we now, six, seven months after? And here we are now. It’s crazy how fast it’s all gone, and I have him to thank for a lot of it. And obviously, getting to work with him onscreen is really special too. He’s one of the people who, in that down period of British wrestling, was actually out there keeping it alive somewhat. He’s an ambassador for it, and I think that’s why the UK stuff has felt so special. It’s how passionate he is about it, and I think that’s a really big part of it. Not just him, but Robbie Brookside, Fit Finlay, they’re all so passionate about British wrestling. Because they saw it when it was on TV and saw it decline after that, and I think it feels special to them that it’s back. Q: What’s it been like being in Orlando performing and being able to train there? A: That place is unbelievable. I started on some mats that we kept outside and they were frozen, and we didn’t have a ring. The first time I was in a ring was my first match. We had these terrible judo mats and we were jumping off tables on the sides trying to learn moonsaults. It wasn’t the best place to start. I’ll never knock it, because I got to start at twelve years old. But to go from that little community centre in Coventry to go [to Orlando] and see the facilities that they have is even more than another world. It’s absolutely unreal. Q: You spoke about how your motivation for that match in Mansfield was quite low before you got the call from Regal. Was there ever a point where you thought “is this going to go the way I want it to go, my career”? A: Oh, I never thought that. I was always “it’s going to happen eventually”. Even before this I was working hard and trying to make a living. To me, it wasn’t about always being here. This was a goal I wanted to accomplish, but I didn’t think it’d get to this level so soon. It’s not even a year ago since that me and we’ve got this far already. I’ve done the Smackdown tour, I’ve been on XTV multiple times, we’ve done a few different UK shows doing this tour, I’ve been at Wrestlemania, I’ve won a title in that short space of time. Like I said, I have got Regal to thank for a lot of that, and having that ten years prior where British wrestling was performing for audiences who really cared about what you were doing, and you had to travel and get yourself out there. I picked up a lot of experience through self-teaching, and now I can go to the performance centre, I have direct contact with Regal or Triple H, to really develop my character and progress further in this company. Q: How was that Smackdown? Rubbing shoulders with people like AJ Styles who you said you used to watch when you were younger? A: I’d met AJ a few times before that at independent shows, and I think that’s the coolest thing about it. Being on that Smackdown tour, looking round and seeing people that we knew before this. That’s still relatively new in WWE, but look at the success rate. They’re the people I was admiring even before they were here, they’re almost self-taught but they’re on the right path. Those are the steps I want to follow in. I’ve built something myself but now I want to progress it, enhance it and become a full-fledged superstar. Q: When looking at your progression are you surprised how quickly it’s all happened since joining WWE? A: Yeah, it’s pretty much all we talk about on these buses. We can’t believe it. From that tryout in November, December we had the press conference, January was the tournament, and every month seems to be something equally as big. [Before the tryout] I kept getting told “you’re really young” and I wasn’t expecting anything from it. I thought I’d have to go to Japan and keep building a name and reputation for years before I was able to get here and do tours. But it was just finally right place, right time, after eleven years trying to get to it. Being backstage at Wrestlemania and seeing Undertaker, Shane McMahon, people I’d been watching on TV since I was a kid…they’re really larger than life. Then there’s a bunch of British lads. The same with the NXT guys, like I said, the guys who came from the independents. It just feels like all my peers are coming here too. It’s just really nice, I think. We didn’t have people teaching us, we just wanted to learn. There are obviously things that need to change and improve here but we’re on the right path and that’s a nice feeling. Q: And how nice is it to know that you’re helping the British independent scene? I know that indie shows over the last few months have noticed that they’re gaining more fans. A: We talk about that too. Every independent show we go to now, most of them sell out. Progress can sell out 700 tickets in a minute, the sky’s the limit with that company. And there’s ICW, OTT in Ireland. That, for me, has been the best part about all of this. I’m still getting the best of both worlds. WWE have been so great to me that, even before this tour, I had an independent date in Scotland, I had to do a seminar which are always really rewarding, then I flew to Dublin and got to go back to OTT, which I credit a lot for helping me make my name and my character. It’s amazing to get to experience the best of both worlds. We get to take ourselves out [of WWE] and into a more intimate setting. We can speak to the fans at the merch table and hear their thoughts on what we’re doing. It does make us really proud. Q: Looking at people like Regal and Neville, how much would it mean to you if you were able to fight them in a match, perhaps? A: I don’t think I could ever wrestle Regal, as much as I’d love to, and I think he’d love to as well, to be honest. But Neville, that could happen. I’m sure it will happen. I’m excited for that one. Q: Where did the term ‘Bruiserweight’ actually originate? A: I was in China for three months and me and this guy called CJ Banks who wrestles around here a lot needed a name. The Cruiserweight stuff was just coming about and we thought [Bruiserweight] was pretty funny. We put that on social media and I never thought any more of it until Andy Quildan [Revolution Pro Wrestling promoter] messaged me and said “I want you to do this Bruiserweight stuff”. I went along with it, and it’s become what it has. Like I said, I spent that year trying to stand out as much as possible, and I think the name ‘Bruiserweight’ fits that character, whatever he is. Q: Obviously this is the first WWE show in the UK following recent tragedies in London and Manchester. I was just wondering how you felt about that? A: I think tonight’ll be really special. Obviously it’s unfortunate that they had to cancel the Manchester event, but it was the right thing to do, in my opinion. I didn’t get to go and meet any of the wrestling fans affected [by the terrorist attacks] but I know a lot of the guys did and they were all talking about how special that was. That’s the power of WWE, they’re getting to experience stuff like that. I was jealous, myself, that I didn’t get to go and do it, but hearing the lads talk about it, it sounded like a really great experience. Q: How’s life changed for you since becoming part of the UK brand? A: Drastically. I was still in my routine. It wasn’t that I was less motivated about wrestling, but sometimes it just felt like another day at work, Now, whether it’s an independent show or I’m in the performance centre for a couple of weeks or I’m backstage at Wrestlemania, every day feels completely different and I’m working hard. It’s everything we aimed for and I’m getting to do it at such a young age. Q: What do you think is going to make your reign as UK champion different from Tyler Bate’s? A: Every time I wrestle, I want to have the best match of the show. I feel that responsibility now, and I know Tyler did too. In that respect, I don’t know how different it’s going to be, but I feel the responsibility to elevate the UK scene. In this period now where it’s a little bit uncertain, I want to be sure that brand happens. I know the guys do too, but me having that title puts me at the forefront of it. In terms of the ring, I think it’ll be a lot different to the way Tyler was. That [match] was literally a boyhood dream come true. I have more of a mean streak and it’s two completely different people so it’ll be different in that respect. But as for match quality, I think we both had the same mindset – “we have responsibility and we need to kill it”. Q: What’s the best piece of advice you’ve had from someone since becoming a wrestler? A: I can’t pinpoint the biggest one, but from a few different people I’ve picked up that you just need to be yourself and unique. That was one of my biggest worries coming here as someone who didn’t have that name value or exposure, that I’d have to change to fit in. But that wasn’t the case at all. Q: When you talk about the UK show, what talent would you like to see in there who aren’t in the WWE? A: There’s so many. Chris Brookes, Kid Lykos, Travis Banks who’s from New Zealand but based here…and of course there are people like Zach Sabres, Will Ospreay and Marty Scurll who are contracted elsewhere but hopefully there’ll come a time when they can move over here. CJ Banks is a bit more unknown, but he’s one of the best wrestlers I’ve ever been in the ring with. There’s huge talent in that sixteen, and I think even in that sixteen people haven’t seen everything from them. There’s a lot of talent that’s gone under the radar that will get the chance to explode and people can invest in them more, but outside of that there’s a massive wealth of talent, with is one of the reasons I’m so passionate about [the show] happening. It’s not just four or five of us, there’s a whole scene full of people who are all different and entertaining. I can’t wait until all those people get here. Q: What about the increased media responsibilities? Do you enjoy doing media or is it a bit of a disruption? A: It’s just new to me. Wrestling’s wrestling. I’ve done it for so long and that’s the fun part, the bit that I love, and it feels natural now. Whereas this kind of stuff was so new to me and we were rushed into it because we came together so fast. We’re just learning as we go. I’m enjoying it though. It’s something different and it keeps us busy. For me, one of the biggest problems – I think it’s a British thing – is being emotional about stuff. I try to downplay everything. Me and Tyler seem laidback about [wrestling] but it’s actually really important to us and we’re really passionate about it. Q: Who were your favourite wrestlers as a kid? A: AJ Styles was obviously a big one. Rey Mysterio. I was really into the High Flyers – I never really appreciated the Regals and Finlays until I was older and realised why they were so good. And people like The Rock, obviously. I think every kid loved him. Q: And your favourites now? A: Neville’s brilliant, I think he’s really come into his own. I think he had a lot in him that people didn’t know he could do. Aleister Black, I’d love to work with him. There’s so many people, talent is through the roof now. Q: For those who don’t know, what is British Strong Style? And how does it differ from Japanese Strong Style? A: In Britain, there wasn’t someone saying “this is how you become a pro wrestler” – I had to teach myself and pick up bits and pieces at different shows. Then I had to go to Japan and pick up how they do it, then I spent time in China. Those people didn’t know what sports entertainment was so I had to teach them from the ground up. Every bit was a different piece of the puzzle and I think that created what I feel British Strong Style is. There’s a big focus on the athletic stuff and spectacular stuff that isn’t the focus of more story-heavy WE programming. That makes us stand out a little bit. And there’s that old technical style to British wrestling that I always try to make sure I have a bit of in my matches, because it’s important to think about where you came from. Q: In terms of story, who would you like to work with in a program? A: The big one for me is Brock Lesnar. I like that you believe in him, because that is him, you know? I try to carry myself that way and hope to reach that level someday. I think it’d be a match people wouldn’t expect. Q: That’d be your dream match at Wrestlemania then? A: Ideally, Regal. But I don’t think that’d happen. A: I think it’s the audience. They’re the biggest part of it, really. RAW after Wrestlemania always seems so special because loads of people in the crowd are British. It’s the football chants and that kind of stuff. I know that just from doing independents, and I think it’s why stuff like Progress and ICW have done so well to British crowds. It’s the culture here when it comes to stuff like football translating to wrestling – the crowds are a bit rowdier and fun at times. Q: I think a lot of British fans keep asking the usual question of “is Wrestlemania ever going to come to the UK?”. Is that something ever spoken about backstage? A: It’s not anything that I’ve heard, but I always try and talk about it. Like I said, the responsibility of having that title, if I can help that happen, I’ll try my best. Whether it’s that or a different pay per view or live event on the network. The more British wrestling we can get as a part of that, the better, right? I hope one day we can do that.